A waste treatment facility for a flavor and fragrance plant was having leakage problems with true union PVC ball valves. They found that valves located near their pumps were being exposed to vibration. The union nuts on the PVC ball valves were loosening with this vibration, allowing leakage of acid and caustic through the body seals. This was a hazard for plant personnel, an OSHA red flag, and a spill problem that required several calls to the EPA. Facing fines and possible shutdown, the plant needed to react quickly. Assured Automation was contacted to present an alternative valve that could eliminate these problems. 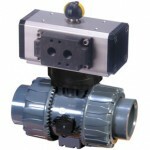 The P2 Series True Union 2-Way ball valve was presented. The P2 Series is a true union ball valve, similar to many other PVC valve manufacturers, but it features a patented locking feature on the union ends. This ratcheting lock allows the union nut to be tightened and locked in position. The union nut can only be loosened if the plastic ratchet is held down while rotating the union end. 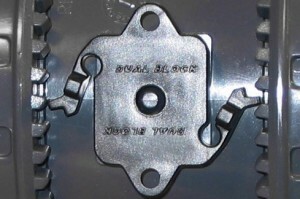 The valve also features deep square style threads for the body/union for increased strength. There is an expansion and contraction groove on the valve body to allow for thermal expansion/contraction. There is also a molded mounted pad for actuation standard on all valves, which was ideal for this application, since these valves all had pneumatic actuators and limit switches. After seeing the design features available with the P2 Series, the plant immediately ordered 25 valves to replace their entire waste treatment site. After 2 years in service the plant has not had a single leak. The P2 has become the corporate valve standard for all PVC and CPVC valve installations. This entry was posted in Latest News and tagged P2 Series, PVC Actuated ball valve, true union ball valve. Bookmark the permalink.